It seems all but inevitable that New York State will legalize recreational marijuana sometime this year, now that the governor and leaders of the legislature all agree that it should happen. But a coalition of groups, including county sheriffs and the PTA, warn of moving too quickly. They say there are several serious factors to consider, including the potential of increased traffic deaths and stepped up drug use by teens and children. 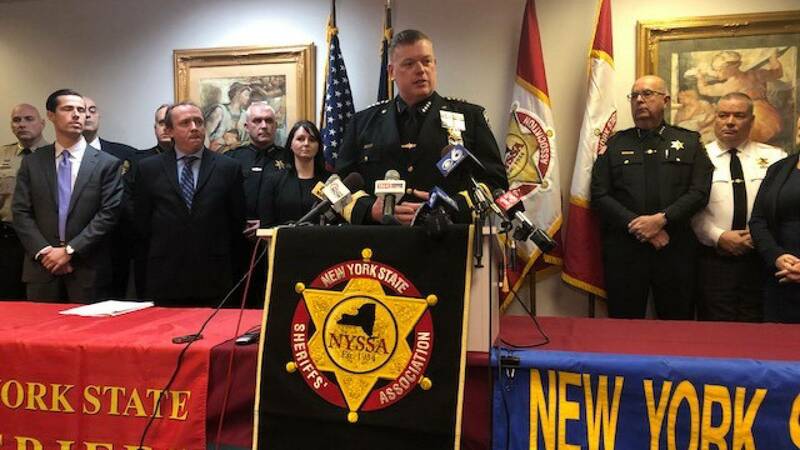 The Sheriffs and Chiefs of Police Associations, along with county health officials, AAA, and the PTA say they know they’ve been slow to voice their concerns, as the push to allow adults to use marijuana in New York has gained momentum. But they say there are some negative consequences that need to be thought through, before lawmakers act. Oneida County Sheriff Rob Maciol is President of the New York State Sheriff’s Association. The chief of Police of Malverne, on Long Island, John Aresta, heads the New York Association of Chiefs of Police. He says law enforcement is already overwhelmed with the opioid crisis, and don’t look forward to having another drug to contend with. He criticized Governor Andrew Cuomo, for changing his position on legalizing recreational pot. Cuomo, just two years ago said he thought using marijuana led to harder drugs, but now, in his budget, he has proposed legalizing the substance. Cuomo says he changed his mind on legalizing marijuana after neighboring states allowed the drug to be sold to adults. County health officials from across the state are also against legalization. Their association’s executive director, Sarah Ravenhall says the use of marijuana can cause an increased risk of stroke, respiratory problems, and unintended exposure of the drug to children. She says because the drug has been illegal in the United States for so long, not enough research has been conducted into the long term effects of marijuana use, leaving health officials in the dark about potential future harm. “There will be a public health impact,” Ravenhall said. The New York State PTA’s Kyle Belokopitsky, says permitting adults to use marijuana in New York will increase use of the drug among children. She compares it to the use of tobacco products among children. And she says legal recreational marijuana is at odds with that. The groups say if the measure is going to be approved, then the sheriffs and police departments would need more funding to retrain or even replace their drug-sniffing dogs, who have been trained to detect marijuana along with other substances. They say they also need to hire and train more Drug Recognition Experts, to help determine whether marijuana is a factor in a traffic accident, something that is difficult to do because the THC contained in the drug stays in the bloodstream for a long period of time after use. The PTA’s Belokopitsky says she plans to bring 100 parents to the state Capitol next week to lobby lawmakers to at least take the proposal out of the state budget, and devote more time to addressing opponents’ concerns. Assembly Speaker Carl Heastie has already called for more time to work out details of the bill and put off the measure to legalize marijuana until later in the spring after the budget has passed. A spokeswoman for Heastie Kerri Biche says his main concern, though, is ensuring that communities negatively affected by marijuana prohibition receive economic benefits and opportunities. A spokesman for governor Cuomo Tyrone Stevens says the governor’s office did reach out to law enforcement when crafting the legislation and believes that more Drug Recognition Experts can be funded through tax revenue generated from sales. And he says any new law would enact more stringent rules against driving while under the influence.